Chris Cillizza at the Washington Post declares the "cool, calm, collected" Pence the winner over Kaine, who was "trying to load so many Trump attacks into every answer that it made it virtually impossible to grasp any one attack." But Pence probably made a better case for Pence 2020 than he did for Trump 2016, Cillizza writes—and overall, the debate was like "watching two kids throw mashed potatoes at each other," only less entertaining. 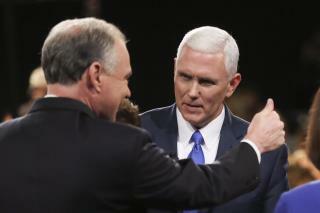 At RedState, Caleb Howe sees Pence as the clear winner and Kaine—who "tried to be an attack dog but came off more like a yipping pup nipping at the mailman's heels"—as the clear loser. But another loser, he writes, is Trump, partly because "Pence winning only shows how truly terrible Trump was during his debate." Dan Roberts at the Guardian also says it was a bad night for Kaine. When "he should have calmly shredded the inconsistencies between Trump and the rest of planet Republican, he came across as the nervous and jittery one," Roberts writes, calling it a missed opportunity because "so much of what the vice-presidential nominee had to say in defense of his boss did not pass the smell test." Pence succeeded in giving the Trump campaign a calm face after more than a week of turmoil, writes Errol Louis at CNN, who credits the Indiana governor's years as a radio talk show host for the smooth performance. Pence, he writes, has "demonstrated to other Trump supporters how to defend their candidate without doubling down on his abrasive style." The big loser here was the truth, according to Politico, which notes that the facts "started taking a beating" when Pence called Longwood University "Norwood University," and takes a look at inaccurate statements from both candidates on issues including foreign policy, taxes, and immigration. Kaine wasn't sexist or rude he was merely pointing out how ridiculous Drumpf is. He pointed out all of Drumpfs comments and gave Pence an opportunity to refute and all he could do was lie about it. One must fight fire with fire so the Democrats must point out the ridiculousness of Drumpfs Presidential bid. Kaine was simply sexist, ignoring the moderator, and rude, interrupting over 60 times.. Democrats think being angry and rude makes them right because being angry makes them feel right. Being right has no feeling associated with it. Gov Pence was extremely Presidential and Kaine was the typical, undignified, hysterical, vicious Leftist activist attack dog. Democrats have no tolerance for the good in anyone.